By midday oil was washing up on the island of Akerøya and by Saturday it had crossed the fjord to the islands of Hvasser and Tjøme. Emergency workers were finding increasing numbers of seabirds covered with oil, and dead. The ship, the 17,000-dwt cargo vessel Godafoss, spilled oil in an area that borders the new Outer Oslo Fjord National Park. The coast guard effort was declared an official “state action,” bringing much-needed emergency personnel along with the ongoing recovery efforts. Nils Petter Andersen of Trafikksentralen in nearby Horten told Norwegian Broadcasting (NRK) that the cause of the grounding was unknown, suggesting that a commission was required to investigate the issue. He did not know how the vessel had gone off course half-a-nautical mile before it grounded, and confirmed that the pilot had left the ship a short while before the accident. Andersen stressed that this was “not unusual” if the captain was “well familiarized” with the area, and it did not constitute a violation of rules or regulations. It was unknown exactly how much oil was on board the ship, built in 1995, but estimates were as much as 800 tonnes. Oil was leaking from two tanks that can contain 250 tonnes each on both sides of the ship, which currently sits lopsided where it ran aground. The leak was halted by Friday evening, but damage was already done. Clean-up crews were finding “more and more” oil around the island of Sandøy off Hvasser, and a slick was observed from Verdens Ende at the southern tip of Tjøme extending south to the Svenner lighthouse outside Larvik. 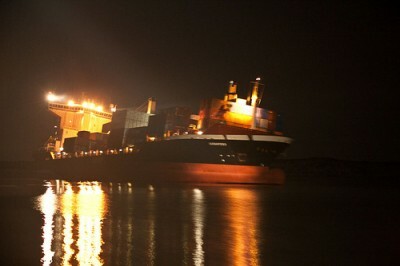 The oil was being carried by the currents, and Swedish vessels were aiding in the clean-up efforts. 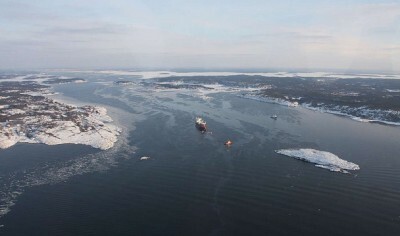 Coast guard officials told NRK the spill was, however, “under control” by Saturday evening. The vessel, registered in Antigua and Barbuda, is owned by Icelandic firm Eimskip, and was on its way from Fredikstad to Helsingborg in Sweden, with a further route taking it to Denmark, the Faroe Islands and finally Iceland. The coast guard put out a series of booms around the area to contain the spill. Norwegian and Swedish authorities are cooperating, with the Swedish coast guard operating surveillance flights to monitor the situation and preparing to deploy a further layer of booms. Speaking on the relief effort, coast guard captain Pål Bustgaard told the website f-b.no that “this is an oil catastrophe. The oil slick continues to widen out. And it is frightening that this happens in the middle of a national park.” He added that there was more oil being observed than originally estimated. Hvaler is also a popular recreational area in the summer, dotted with holiday cabins and marinas. The relief efforts were aided by good weather and relatively calm waters, expected to last for the coming days. Early observations showed that the oil was leaking out towards the sea and away from land, with a 2.5 nautical mile slick seen moving south and southwest with the direction of prevailing winds and currents. Later reports from NRK, however, suggested that the slick was turning northward and inwards towards land, which could threaten the area of Vestfold, lying on the western edge of Oslo Fjord. The Norwegian coast guard confirmed oil was washing up on the island of Akerøya by midday. The leader of Green Warriors in Norway (Norges Miljøvernforbund), Kurt Oddekalv, told NRK that he fears a serious environmental disaster in the area, and believes that a recovery effort will be made difficult by the generally harsh winter conditions and lack of suitable equipment to mitigate any problems. He called for stricter rules on sea traffic in the environmentally sensitive area, although a former ship pilot speaking to NRK suggested that the region was not especially difficult to navigate. Two government ministers traveled to the scene of the grounded ship Friday afternoon and said measures would be considered to redirect ship traffic in the area, away from the national park area. NRK reported that the vessel’s captain had admitted a navigational error but it remained unclear how he could have erred so badly. Routine tests showed no signs that he was under the influence of alcohol. This latest oil spill comes just weeks after an accident off Karmøy, near Haugesund in southwest Norway, which saw hundreds of thousands of litres of diesel leak into the surrounding waters. Indeed, the Outer Oslo Fjord National Park is no stranger to dangerous encounters with large ships, as a 103-meter long vessel known as ‘Cometa’ ran aground just last November between Oslo and Fredrikstad, although no oil was spilled. Norway’s oil spill preparedness has been called “shameful” in the wake of the 2009 grounding of a Chinese tanker off Telemark. The resulting spill fouled the coast south to Kristiansand, including bird and nature preserves.